In Unit 4 of the Node.js Learning Path, I do a deep dive into asynchronous and synchronous programming. To fully understand this concept, I will walk you through three different scenarios that compare the two programming models and demonstrate why Node’s asynchronous programming model makes it so powerful. We also cover some key concepts along the way, including Node.js’s module system, performance profiling, and Node’s http module. The code you need to follow along with the examples in this learning path are in my GitHub repo. If you search the web for Node.js, you won’t have to scroll through many results before a theme becomes apparent: Node.js uses a non-blocking – asynchronous – coding style. You may be wondering, “Why would Node force developers to do this?” I’ll explain the answer to that question in this unit and give you a few more Node tools. But first, I want to tell you a story that illustrates the difference between blocking (synchronous) and non-blocking (asynchronous) coding. This story is about two familiar types of business: the bank and the coffee shop. While they serve very different purposes, fundamentally they exist to serve us. How they do that is very different. You walk into your local bank branch, and in front of you is a queue of customers. In front of the queue are several teller windows, and behind each open window sits a teller assisting a single customer. A single teller may only help one customer at a time. The teller handles all steps in your transaction in order. If the teller cannot handle a step in your transaction – let’s say it requires a supervisor approval – the teller is blocked waiting for the approval before he or she may proceed. When the entire transaction is complete, you leave the teller window. The nature of a banking transaction is synchronous. The teller alone must complete all steps in the transaction before the teller can assist another customer. You walk into your local coffee shop, and in front of you is a queue of customers. In front of the queue is one counter employee who takes orders and processes payment, and one or more baristas behind the counter preparing orders. A single counter employee may only help one customer at a time. A barista prepares one order at a time. The counter employee and barista share all the steps to complete your order. While the barista prepares your order, the counter employee is not blocked and may take other customer’s order. Later, when your order is ready, your name is called, and you step forward to collect it. The nature of a coffee shop transaction is asynchronous. The counter employee simply takes orders, processes payment, and collects enough information so that the customer can be notified when his or her order is ready. The counter employee then helps the next customer, while the barista, in parallel, works on fulfilling orders. Blocking: At the bank, the teller helps you from start to finish. Customers in the queue behind you must wait until your entire transaction is complete. If there is a step in the transaction that cannot be completed by the teller, the teller is blocked while that step is completed. Non-blocking: At the coffee shop, the counter employee and the barista work together to complete your order. The counter employee takes your order and is not blocked while the barista completes your order. I realize this isn’t a perfect analogy (some banks use multiple tellers to complete transactions, and some coffee shops have multiple people taking orders), but hopefully you understand the difference between the two programming models. Other software stacks use the bank model. To scale, more threads (or processes) are created. Apache web server is one example that uses the bank scalability model. Both models, of course, can achieve horizontal scalability by adding more servers. Now, there is a “dark side” to the non-blocking model: the chatty coffee shop counter employee. What if the employee at the counter is more interested in chatting with each customer than in diligently taking orders and payments? The line backs up, the baristas idle, and the whole process grinds to a halt. In the first example (Act One), I take liberties with this definition just as a way of introducing the topic. Thank you in advance for this leeway while I move the discussion towards true blocking vs non-blocking examples. We will get there. All of the source code examples below are available in the GitHub repo for the Learning Path. To save space in the listings, I removed the comments, and added line numbers where it helps me explain specific lines of code. I encourage you to clone the code from GitHub and run the examples with me as you move through each unit in the course. Example 1 is a run-of-the-mill synchronous style program. It runs from top to bottom on the V8 thread, and just chews up some CPU (again, this is not technically blocking, but please bear with me). After chewing up 20 milliseconds of CPU time (by constantly checking the system time), the loop terminates. Since there are no callbacks in the event loop, the program ends. Example 2 is similar to the one above, but it uses asynchronous programming. 1529597656525:event loop (callback): Asynchronous processing complete. Invokes setTimeout(), telling it to timeout in 20 milliseconds. After no less than 20 milliseconds, the event loop invokes the anonymous callback funciton provided to setTimeout() and it runs, outputting the Asynchronous processing complete message. So what’s the difference? If you look at the output from Example 1, you can see that the synchronous code ran in about 22 milliseconds, but the asynchronous code (Example 2) ran in about 25. Each message contains a timestamp in milliseconds. Asynchronous is slower! Should you be worried? Not at all! As you move through this unit, keep this in mind: the asynchronous programming style isn’t about pure speed; it’s about scalability (think coffee shop, not bank). Before we move on to our next comparison of the two programming models, we need to talk about Node’s module system. In previous units, I mentioned modules without really defining them, so let’s do that now. This is how you ran Examples 1 and 2. This method tells Node that you wish to use the fs module, through the require() function, which we’ll talk about shortly. Modularization is a key concept in modern software development. It allows us to build more robust code and reuse code in multiple places, instead of having to write the same code again and again. We will look at each type of module above in detail as you move through the Learning Path. To use a module, you need a reference to it, which you obtain through the require() function. To access the File System API, you get a reference to the fs module by calling require() on it. At that point, you can use its interface, such as calling readFileSync(). How do we fix this TypeError? By using module.exports and require('./foo'). Remember when I said that, by default, all of the code in a module is hidden from the outside? You are seeing this in action: The foo hello() function cannot be seen by the bar code. Why do we have to specify the relative path to the foo module? require() has a very lengthy search algorithm it uses to resolve a module’s location when it needs to load that module. For custom modules, if you want to reference a module you’ve written (foo) from another module you’ve written (bar), the referencing modules must use the referenced module’s relative path as the argument to require(). I recommend you check out the Modules API docs if you want to learn more about Node’s module system. File processing logic: all of the code that reads and processes files is located in the file-processor module. Message logging: all of the code that outputs messages to the console is located in the simple-logger module. Before we dive into another head-to-head performance comparison of the programming models (Act 2), let’s look a little closer at these two modules, as they give you a pattern to follow when you want to write your own Node modules. The file-processor module contains most of the business logic for the examples in this tutorial. I named the functions in file-processor to match the naming style of the Node API: a function that behaves synchronously has the word Sync appended to the function name, an asynchronous function does not. Note: the constants SALT, NUMBER_OF_ITERATIONS, etc., are at the top of file-processor.js. Their values are not really relevant for these examples, but I wanted to point out where the source can be found in case you’re interested. Like I said, functions in the Node API that are asynchronous have no name qualifier because asynchronous is Node’s default. Log Level, implemented by the Level object, which is associated with every message and allows any callers that are dependent on this module to throttle the message logging. The current Log Level, set to INFO by default, but can be changed by callers. The log() function, which is the internal implementation that selectively logs to the console. Helper functions, such as info(), which logs informational messages, debug() for more fine-grained debug messages, warn() for warnings, and so on. To use simple-logger, modules call require(./simple-logger) to obtain a reference to the module. Optionally, call setLogLevel() (if the default of Level.INFO is not acceptable) to set the current log level. Finally, call various helper functions to perform the actual logging. Every message that is a candidate for logging has an associated Level. If a message’s Level.priority is at or above the current Log Level‘s priority it is logged. Otherwise, it is ignored. The setLogLevel() function is used to set the current log threshold, which is stored in a module-scoped variable called logLevel. For each Level there is one helper function, each of which delegates to the log() method, passing its corresponding Level. Listing 6 shows the helper functions. That covers the custom modules you use in this unit (though, simple-logger will appear regularly throughout the Learning Path). Now it’s time for another head-to-head comparison between synchronous and asynchronous coding styles, which I’ll call Act Two. The examples we looked at earlier are too simple to be real-world examples. Real-world code uses modules and does interesting things like read files and encrypt things. When the code on line 4 executes, V8 is blocked waiting for the I/O to finish before executing line 5. Let’s run it now, using an example wrapper I’ve provided called example3.js. Note: You might notice I’ve beefed up the logging output a bit, including computing an elapsed time so we can compare elapsed times between synchronous and asynchronous. That’s the simple-logger module at work. Let’s compare the performance of example3 with its asynchronous counterpart. When V8 executes this function on the mainline of example4.js, Line 4 executes and passes an anonymous callback function (to be invoked when the I/O finishes), and then the method returns. When the I/O is complete (at some later time), execution begins on line 5, and on line 6 another asynchronous Node API call is made to the crypto API (again, passing an anonymous callback function), which uses the file’s contents as the “password” to create a derived key. Then line 16 executes, and the function returns. When the crypto function completes (at some still later time), execution begins on line 7, where eventually on line 14 the resultsCallback is invoked, passing the results (along with an err object) to the caller. Whoa! So in actuality there is not one trip through the code in processFile() but three trips (executing different lines of code each trip through, of course)! Welcome to Node and asynchronous programming! So, now let’s run it. I’ve provided another wrapper called example4.js that runs the processFile() function (see Listing 2). On my Macbook Pro, example3.js (synchronous) ran in about 165ms, compared to example4.js (asynchronous), which ran in about 180ms. Seems like the synchronous code is faster again. If you’re getting worried that asynchronous code just doesn’t perform, I totally get it. But I encourage you to reserve judgment until Act Three. Before we go further, we need to talk about performance profiling. As a professional Node developer, you should know how to run a performance analysis (called a profile) on your code. This profile tells you where in the code V8 is spending the most time executing. These locations are sometimes called “hot spots”. --no-logfile-per-isolate – Each time you run node, the instance of V8, called an isolate because the state of each V8 instance is isolated from all others, is assigned an ID. By default, this ID is part of the log file name. This argument tells the profiler to produce a single log file (called v8.log) each time it runs, overwriting the previous log file. --logfile=exampleX.log – creates a log file called exampleX.log in the current directory. Combined with the --no-logfile-per-isolate flag, it overrides the default filename (that is, v8.log) and uses the value of the --logfile argument. Statistical profiling result from v8.log, (215 ticks, 1 unaccounted, 0 excluded). 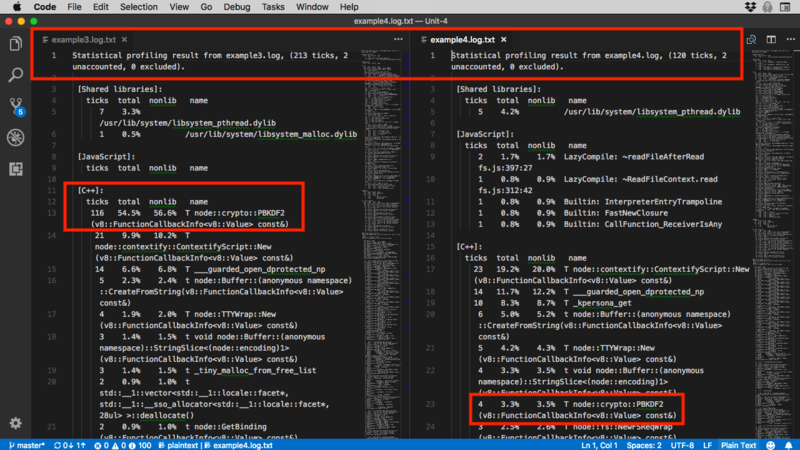 To run the profiler and process the output in a single command, do this: `node –prof –no-logfile-per-isolate –log –logfile=example3.log example3 && node –prof-process example3.log less && rm example3.log. This lets you view the analyzed profile, then remove the originalexample3.log` profiler output file, leaving your source directory less cluttered. Right away, you can see that 118 ticks (or 54.9% of total) were spent in a Node core library called crypto::PBKDF2, which is the library that handles password-based key derivation (remember that from Listing 1, line 5?). amount of its parent calls. Callers occupying less than 1.0% are not shown. The information is pretty intuitive, though you may have to stare at it for a while before it makes sense. One thing I want to mention, the Bottom-up profile is formatted to be indented like a call stack, so you can see the order the functions were called (each nested call results in further indention under the name column). Exercise: Run the profiler on the example4.js code. Hint: make sure to redirect the output of node --prof-process to a different logfile than you did for example3. I suggest example4.log.txt. Once you’ve completed the exercise, let’s compare the results of exercise3 and exercise4 and see if anything jumps out at us to explain why synchronous is still faster than asynchronous. Recall the runtimes: synchronous code (example3.js) : 165ms, versus asynchronous (example4.js) : 180ms. Yet the number of ticks is almost 100 less for the asynchronous code. Time spent doing encryption: synchronous is roughly 55% of total, but asynchronous is about 4%. At first glance, these results might be mystifying. How can the asynchronous code result in over 90 fewer samples of the V8 profiler yet run about 15ms slower, since the corresponding example4 code ran about 15ms slower. You might think the slower a program’s response time, the more opportunity the V8 profiler would have to take samples, right? How can you perform the same encryption, yet the asynchronous code uses so much less of the V8 thread? (Check the results, and you’ll see the derived keys computed by both examples are identical). The answer is simple, and lies at the heart of why Node.js is so powerful. Most of the asynchronous code is not running on the V8 thread. It’s running in the event loop (well, technically, it’s running in the worker pool, which is part of libuv)! There’s no magic involved. The code has to run somewhere! It’s just not running on the V8 thread. So why is async slower? The difference in runtime is probably just related to libuv overhead. So, if that’s the case, and the asynchronous code’s encryption processing is not occurring in V8, but in the thread pool, then a load testing tool would demonstrate that, and the asynchronous code would run circles (from a response time standpoint) around the synchronous code. To see that demonstration, we need to make the code suitable for running in an environment where we can load test it (say, wrap it in a simple HTTP server). Act 3 shows this load testing scenario. Earlier in this tutorial I noted that asynchronous programming isn’t about pure speed, it’s about scalability. We are about to put that to the test. In a single request, head-to-head comparison, synchronous wins with pure speed. However, when we run the asynchronous code against lots of simultaneous requests, its scalability should shine through. To deploy the code for examples 3 and 4 in a way where we can load test it, we have to wrap it in an HTTP server and strain it using a load test tool. Before we can dive into the load testing, you need to understand Node’s http module. /processFileSync – runs file-processor.processFileSync() inside the HTTP server. /processFile – runs file-processor.processFile() inside the HTTP server. The cool thing is, while ab was designed to load test Apache web server, it works with any HTTP server. This is good for us. Apache web server (which includes Apache Bench) should already be installed on your Mac. If you are running on Windows, Linux, or another platform and need to install Apache web server, please check out this page for installation instructions. Use ab -V to verify that ab is installed. loadtest is a very popular load test tool that installs as a package through npm. It uses the same basic runtime options as ab and this is by design, so if you’re familiar with using ab you should feel right at home with loadtest. To verify that loadtest is installed use loadtest -V.
Apache Bench sent 100 total requests, making sure that there were 10 concurrent requests at all times until the test was complete. The total time was 15.6 seconds for all 100 tests. Now let’s run it using the asynchronous code. Wow! It appears that there’s something to this whole asynchronous code thing after all. Turns out, when you’re running a single Node program like node example3 versus node example4 that synchronous wins on pure speed. But under load, scalability is king, and nothing beats asynchronous code. I encourage you to play around with Example 5, including the settings to the load test tool, and convince yourself that when it comes to putting a load on code that can run asynchronously, it really is more scalable than its synchronous counterpart. Remember Examples 1 and 2? What would happen if we pit them against each other? I’ve provided an example HTTP server for this scenario as well. Check out example6.js and run it the same way you did example5.js in the previous section. Okay, cool, the requests took between 20 and 27 ms.
example6.js – constants to define sleep (async) and cpu burn (sync) times. Another core Node tool you need to know about is nodemon. nodemon detects changes to your project’s source files and restarts Node.js if it detects any, speeding up the code-test-repeat development cycle. (Notice the two lines at the bottom appear once you save example6.js). Now run your tests again. I’ve summarized my results in the table below. Now that you have nodemon running, play around with the wait times for yourself until you’re convinced: asynchronous code is the way to go. Or, to put it another way: run as little code on the V8 thread as possible. Each time you make a code change, nodemon will restart Node automatically. We’ve seen how asynchronous code beats synchronous code under load. That’s great and all, but asynchronous code has a “dark side”: code complexity. When more than two processes occur serially (that is, they must be done one after the other), this can result in the Pyramid of Doom. Now, each of the steps above is dependent on the one before it, so they cannot be done in parallel. The result is this sort of highly indented, triangular shape. How do you avoid this? After all, the business logic determines the order of the steps. Answer: Promises. There are more lines of code, but the code is arguably cleaner. The concepts and motivations behind promises are beyond the scope of this tutorial. I just wanted to introduce you to them, and make you’re aware that using them can make the serial nature of the processing steps in your code more visually obvious. I have provided example wrappers, so you can run the code in Listings 7 and 8 if you want to. One last thing before I wrap up this section: You may look at the code in file-processor.processFilePromise() and think that there are a whole lot of promises being created here. Why would we need more than one (top-level) Promise? After all, the use of then() should force the code to execute serially, right? Well, yes, then() does execute serially, but unfortunately, because the underlying code is a chain of asynchronous logic that must execute serially (see the “The Pyramid” illustration at the beginning of this section), the results of the previous asynchronous call aren’t ready when then() is executed, resulting in undefined variables. Because of that, we absolutely do not want the promise bound to its resolution callback before the results are ready, so within each block of asynchronous code we must create a new Promise to force the binding to occur to the next then() in the chain only after we have called resolve() with the results value. To illustrate this, I put together a processFileBrokenPromise() function in file-processor and have wrapped it with example9.js so you can run it. Go ahead, play around with it until you have a good mental model of how asynchronous code really works with promises. I could do a whole tutorial on Promises alone, but unfortunately there isn’t space here to do that. However, I’ve included some links to resources below that you can use to learn more about Promises, including why and how to use them. The difference between synchronous and asynchronous models for handling requests with an intuitive example – the bank versus the coffee shop. And finally, I showed you how Promises can help make the code a large group of serial asynchronous operations more visually appealing and cleaner. In the next unit, we’ll go deeper into the Event Loop, which you really need to understand to be the best Node developer you can be. A callback function is executed following a blocking I/O operation and is part of the synchronous coding style. The Node.js module system is used to extend Node’s functionality and works with built-in modules, and custom modules you write. nodemon is a load testing tool used to test Node application scalability. A. Uses specially formatted comments to tell the V8 optimizer to run the specified code on a background thread. B. Is best suited for short-lived tasks that do not use much CPU. C. Uses callback functions that are executed following the completion of non-blocking operations such as I/O. D. There is no such thing as Asynchronous coding style. A. Refers to a style of I/O where the operation blocks the request thread until the operation is complete. B. Uses callback functions that are executed following the completion of non-blocking operations such as I/O. C. Performs I/O operation in specially formulated blocks (known as “chunks”) in order to optimize throughput. If your application code is using a Node API call to perform a non-blocking operation, only a small percentage of that call shows up in the V8 profile. Where is the code running? A. The code is actually running in a separate thread in libuv’s worker pool. B. The code is running on the V8 thread, there is less of a profile footprint because asynchronous code is simply faster than synchronous code. C. The code is running in a special thread pool managed by V8. D. Node core libraries, like those for encryption, are optimized for asynchronous code, so the V8 profile footprint for those is smaller. When reading analyzed output from the V8 profiler, a single sample interval is referred to as a _, and is typically __ milliseconds in duration. When writing a Promise, you call the __ method when the Promise is fulfilled. When a promise has been fulfilled, you call the _ method to process the results. Write a message to the console if the write I/O operation is successful. Write a module called echo with a single method called echo() that takes a single parameter, and writes echo + the parameter to the console. Write another module called echo-requester that uses echo and passes it a text parameter of your choice. Assume that echo.js and echo-requester.js reside in the same directory. False. A callback function is used as part of asynchronous coding style. True. In addition, Node’s module system works with third party modules that extend Node’s functionality that are available in module registries such as npmjs.com. False. nodemon is a utility that monitors your project’s source files for changes and restarts Node if it detects any. It is used to to speed up development cycle. C. Asynchronous coding style uses callbacks to process the results of the asynchronous call. A. Blocking I/O blocks the current operation (preventing it from running) until the operation is complete. A. The code is running in libuv’s worker pool (a.k.a., the thread pool). Since V8 cannot profile libuv, only the Node core code that hands the call off to libuv shows up in the V8 profile. When reading analyzed output from the V8 profiler, a single sample interval is referred to as a _ tick _, and is typically 1 _ milliseconds in duration. When writing a Promise, you call the _ resolve() _ method when the Promise is fulfilled. When a promise has been fulfilled, you call the _ then() __ method to process the results. Node guide to asynchronous programming Read the Node Foundation's overview of blocking vs. non-blocking calls in Node.js. Node's module system Get an in-depth overview of modules from the Node Foundation. Profiling Node.js code Learn about easy profiling for Node.js applications. Apache Bench Learn more about `ab`, a tool for benchmarking your Apache HTTP server. loadtest loudest runs a load test on a selected HTTP or WebSockets URL. nodemon Nodemon is a utility that will monitor for any changes in your source and automatically restart your server. Perfect for development. Using Promises Learn about using promises in Node.js.